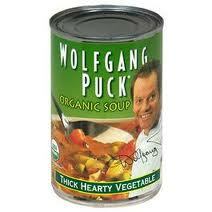 $0.89 Wolfgang Puck Organic Soup w/ Coupons! Have you ever tried this soup before? I've never even heard of it! This is my 4 yr old daughter's FAVORITE soup. It's pretty good! I mean, how many four year olds BEG for Vegetable soup? This is a great deal. I usually pay $2 for just one can! Thanks for this post!